Stay connected with the stylish ZenWatch 2 Smartwatch, which comes with a rose gold case and a rose gold metal band. The ZenWatch 2 connects to your compatible smartphone or tablet to give you access to all your favorite apps directly on your wrist; it also provides convenient up-to-the minute notifications, activity tracking options and much more. The ZenWatch 2 connects to your phone via Bluetooth 4.1 LE and displays notifications, apps, and more on its 1.63" screen. It can also connect directly to the Internet thanks to Wi-Fi technology. A built-in speaker adds an additional layer of functionality, including making and receiving phone calls, setting alarms, getting notifications, and more. The internal battery utilizes ASUS's HyperCharge technology, which provides 60% power after just 15 minutes of charging. ZenWatch 2 is equipped with a stainless-steel casing paired with a curved watch crystal made with Corning Gorilla Glass 3. A metal crown adorns the ZenWatch 2 case, echoing traditional watch styling and providing a convenient new way to toggle the display on and off. ZenWatch 2 lasts up to two days per charge, meaning fewer worries about battery life. With the included Magnetic Pogo Clip, charging ZenWatch 2 is effortless: simply guide the charging clip into place, and it will snap in easily. HyperCharge technology is onboard, meaning you get 60% power on just 15 minutes of charge. ZenWatch 2 comes with a built-in speaker that brings a new level of convenient functionality to your wrist, allowing you to make and receive calls without taking out your phone, set audible alarms, and hear app notifications and sounds. Built-in pedometer with enhanced step counting accuracy, activity tracker, and progress reports help you accomplish your fitness goals. Smart Assistant allows you to see timely information at a glance and get things done with a simple touch or voice command. ZenWatch 2 is certified for IP67 water resistance, meaning that it's completely dust-proof and protected from complete submersion in water up to 3.3' deep. On top of 60-plus exclusive watch faces, you can also create the perfect watch face with style and functionality that's tailored to you. 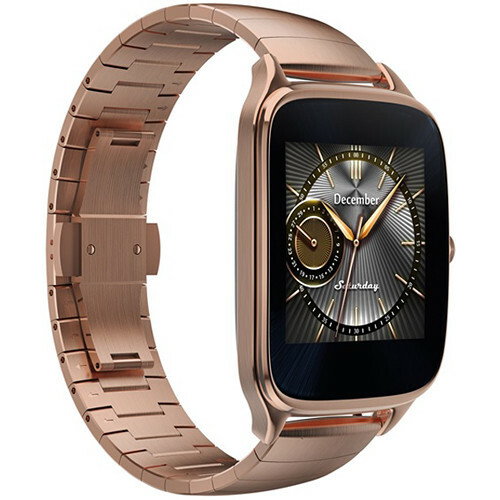 Box Dimensions (LxWxH) 4.6 x 4.1 x 3.0"
ZenWatch 2 1.63" Smartwatch with HyperCharge (Rose Gold Case, Rose Gold Metal Band) is rated 4.3 out of 5 by 67. Rated 5 out of 5 by rayrayjj from asus zenwatch 2 Bought this for myself and my son loved it so because I have 4 other smartwatchs but I think I messed up because the zenwatch was my favourite watch, I myself think it's the best smartwatch out there, the battery is the best out of all of the smartwatchs I have,as good as my Samsung gear s2 if not better and way better than my moto 360 and now that Android wear 2.0 is coming out and this watch will get the update makes it that much more of a better watch, I loved it so much I just bought a new one on B&H . This watch is a great watch and I love it has zenwatch manager. It's a great watch and I highly recommend this watch. Rated 1 out of 5 by Samuel from Not IP67 Bought this watch for my daughter. It worked fine until a few weeks ago when it got exposed to heavy rain. Now an IP67 rating says that it can be immersed in up one meter of water for up to 30 minutes. rain should not have affected it, but ASUS refused to honor the warranty and wanted to charge her $60 for the repair. Last time we buy an ASUS product, since I've since read about others having trouble getting them to honor their warranties. Rated 4 out of 5 by Robin P 21601 from Feels like a real watch I spent decades wearing Seiko and Citizen watches which cost as much as $500. When I had to replace the last one almost two years ago I decided to get the Gear Fit which went with the Samsung phone. I figured it would work best because it was the same manufacturer. That watch lasted just 20 months. The ZenWatch is the replacement for that Samsung device. I like the looks better, I like that it comes in a selection of metal bands, or placstic straps, and also has replaceable leather bands if desired. The cost is middle of the road for any good timepiece and the additional functionality make it a value. Things like tracking heart-rate, exercise/walking and being water resistant mean that I can use more my phones features when I an outdoors. Even when it is raining or when I'm kayaking the watch can stay on without worrying that it will be ruined. I have not been the biggest fan of ASUS computers over the last twenty years. I think that the reviews of the watches and now seeing the quality of the watch have done a lot to convince me that the wearable product from ASUS is definitely a wise choice. Only time will tell. Rated 4 out of 5 by Anonymous from Stylish This is my first smartwatch and I am pretty impressed by it. I love the endless watch face options available, getting all notifications right on my wrist, and being able to take and make a phone call without touching my phone. One thing that needs improvement is range. Bluetooth only works for up to 20 feet away and the Wi-Fi feature is great however it also fails to connect if you are not close to your router. Rated 1 out of 5 by Anonymous from ASUS dropped the warranty entirely When I got this watch I knew it wasn't top-of-the-line, but I will confess I was pretty disappointed with it from the beginning. Very slow response time and I often had to make the same gesture multiple times before it would do anything (if it ever did). I treated it carefully and I kept it in like-new condition. However, the problem came when I went to the beach, walked into the water to my knees and splashed in the water for 30 seconds until I noticed that I had forgotten to take my watch off. I immediately took it back to my bag and left it there. That afternoon when I got it out of my bag it would not turn on and was basically bricked. I got an RMA to ASUS and a few weeks later they responded that my watch would not be repaired under warranty because it had physical or water damage. Now the ZenWatch 2 is advertised to an IP67 rating which is a clear standard saying it can be put in water to a depth of no more than a meter for no more than 30 minutes. I had put it in water to a depth of perhaps 6-12 inches for perhaps 30 seconds. Clearly if there is water damage it is because it wasn't actually IP67 (by definition). But their support (while being very sympathetic) made it very clear that they couldn't do anything - service had the final authority. So how do I contact service? Oh, you can't - you have to go through us in support. But you can't do anything about this problem, right? Right So how do I contact service? and around and around. Completely nonsensical. In the end they win - I gave up on trying to get them to honor their warranty. But at least I can warn you to not expect ANYTHING at all from Asus in terms of warranty! Does it come with a charger or do I have to purchase it separate? For this or any smartwatch what type of apps can you install? I'm more interested in apps that will control say my DJI Osmo, Gopro or Nikon D500... Are smart watches made for this specific type of functionality? I tried to search but didn't find any reasonable results. Thanks. Can you change the band to this watch? Yes, you can change the band. Do you need a smartphone or does a basic phone with bluetooth work? 1.63 gold watch &amp; gold band looks like rose gold in picture, is the color of actual watch more like rose gold like picture ? No. The picture has a red tint where as the actual watch looks just like 14kt yellow gold with a slight red hue suggested but not obvious. No one would look at the one I have any see the red. Yes, it is compatible with IOS, however, it doesn't offer all of the Android functionality. Can it play music/mp3 to a Bluetooth speaker/headset? The watch itself does not hold any music. You can use the watch as a remote to control music that is stored on your phone as you listen on a bluetooth headset. Does it have the same Find My Phone function like the original? Yes, it does have Find My Phone - I don't know if it is the same as previous version. Love the watch and its' capabilities.